Looking back a year - at my pet glacier - It has been a quite year at Zachariae Isstrøm compared to the last 5 years, maybe because of all the attention this impressive glacier received suddenly both here and in the scientific world, who knows (John "Bonzo" Bonham could not cope with it either)? A It is where you find the most important changes, the calving front is retreating and you will find cracks beyond it. B The general calving front is more or less the same, but future calves are seen further behind the front. I may add that thinning of the ice sheet behind Zachariae Isstrøm is a reason for the "break" in the retreat and speed of the glacier? Espen thank you for the animation. I have been wondering about calving front advance/retreat. In the stupid questions department, can yo post the link you use for these hi-res sat images? I know for certain I used to have it bookmarked but it somehow disappeared and I cannot recall what it was. Thanks. What happened during the dark season in 16 Sentinel 1 images. That is so cool, Wipneus! The things I wondered about after looking not too deeply at 6-month old and current images are made crystal clear. You have a talent for posting truly beautiful graphics. Thank you. Nioghalvfjerdsbræ 70 km+ Long Supraglacial stream, Greenland’s Longest? Article in From A Glacier's Perspective describes glacial features that promote long supraglacial streams (low slope, lack of crevasses, etc. ), and what affect such streams may have on other features (smaller lakes, fewer moulins, etc.) plus image from 2011. Click to enlarge. Arrows point to stream; dots show calving front. I wonder if the ice sea would clear out of the bay this year and flush out the calved icebergs. It quite often does, and this year with the extremely low ice cover in the Greenland Sea, and the reverse winds that have blown north, I would have expected it to happen already. There are a couple of zoomables on polarveiw just now that show the area, the tidal 'lake' of 79N has melted, and there's an area south of Zach. isolated but clearly affected by tides + melt that may signal the start of the melt season hereabouts. Wow! In the middle of December. A "new" development at Zachariae Isstrøm, at least for me, I have not seen or read anything about the stream in the southern part of Zachariae Isstrøm before, I named it Zydstrømmen (it should have been Sydstrømmen in Danish, but I picked the Z as in Zachariae instead). I can see from old satelite data that it started as a noticeable stream in the early 2000s, but you may have more to add? Nice catch Espen, and thanks for the long-term ZI animation, it is very useful in general. I have never noticed this mini-stream before. Mini ? It is + 2 km wide! Yeah, apologies for imprecise terms. Only meant relative to the main ice-stream of course. Zoomable from Polar View looking at Nioghalvfjerdsfjorden, the ice in the fjord to it's north is looking thin with some signs of seawater penetration below, the same is true of the sea near the glaciers mouth, it seems a little early, but last year the whole season passed with very little activity. Similar of Zachariae where the outflow seems to have stacked every exit. Thought I'd refresh memories of the bathymetry and undercurrent hereabouts, image first posted by Sidd iirc. 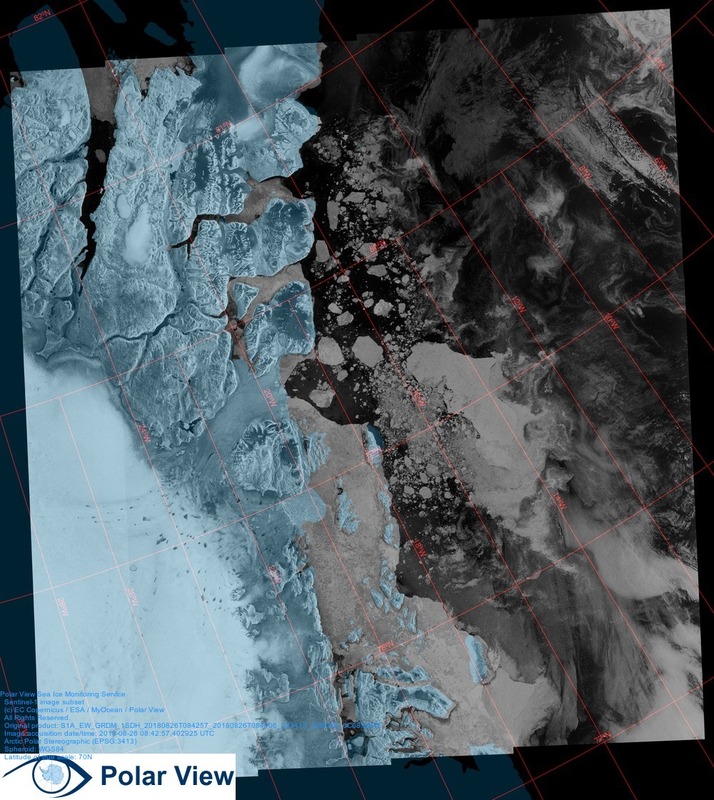 Just received, here is what you can get within hours, images of 2 Ice Bergs at Zachariae Isstrøm from 2 different sources Nasa (from a plane) and Sentinel 2 (from a satelite). thanks for sharing this Espen, but could you let us know where (which website) the Nasa image comes from, I was unable to find it? I think Espen means that the ice flow became noticeable after 2000, not because lack of coverage but because of actual changes.